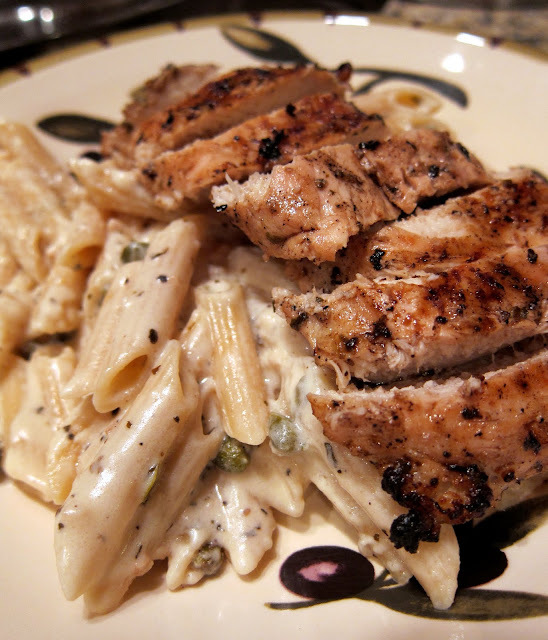 Creamy Grilled Chicken Piccata - grilled lemon herb chicken over a creamy piccata sauce. SO good! Better than any restaurant! We make this at least once a month! A few weeks ago, I saw a recipe for a lemon pasta dish, and I immediately thought "Yuck! Lemon and Pasta sounds nasty!" BUT, I took a minute and thought about how much we love chicken piccata, so why not try a Creamy Chicken Piccata. I decided to give it a shot. The experiment paid off big time. We LOVED this dish. I made the sauce while the chicken was on the grill and just tossed it together - SIMPLE! I marinated the chicken in some lemon and garlic so it would go with the sauce. I took our usual piccata sauce and just added cream to it (well, I did half and half, but cream would be even better). The chicken would be good just on its own, but the creamy lemon caper sauce just puts it over the top. I love when a recipe comes together just like you pictured it in your mind! I like everything about this dish and will have to try it soon. Be sure to check out my blog today. Stephenie, this looks so delicious. I didn't see this over at PW so thanks for sharing the recipe. Great looking dish. I luv piccata. I know that my family would absolutely love this dish. Thanks for sharing. AWESOME! Bookmarked and will be tried very soon, maybe even Sunday. That chicken shot is just luscious. I like the looks of this! The cream just richens it up and makes it all the more delicious! Mmm...I love lemon and pasta, this looks fabulous! looks wonderful. me too with the ick to lemon/pasta... but sometimes things surprise you. yumo!!! I think I love this! I can't wait to try it! I made this tonight and it is amazing! I found you on pinterest and will totally start following you! The only thing I did differently was not add capers. Gag me. lol. But it was still yummy!!! I will definitely use this recipe again. I've never had/used capers before. If I leave them out, will it make much of a difference in the taste? And your pic of this dish looks AMAZING! RWebb - it will change the flavor of the dish, but it will still taste great without them. It is just better with them. It looked a lot creamier in the picture than it came out for us. Also would have left out the capers. Delicious! We added more water to thin up the sauce- and used low fat 1/2 and 1/2. It is Jan but warm in Chicago- we grilled the chicken and it was amazing!!! I made this for dinner last night and it was SO lemony! Way too strong! I didn't have fresh lemons, so I just used the tablespoon measurements for lemon juice, do you think that that was what went wrong? Is bottled juice stronger then fresh? I loved it, just way too lemony for us. I'm making this tonight! Can't wait! We found this over on Pinterest and my hubby made this tonight. It was SO good and we'll be adding it to our stash of regular recipes! Found the recipe on pinterest. i will try it too. This was good except it was SO lemony! I used a bottle of lemon juice as opposed to squeezing lemons, so maybe the measurements are a little off? I think I would reduce the lemons for the sauce by at least half. Other than that, it was good. Made this tonight and we LOVED it. I used heavy cream, but otherwise followed the recipe exactly. I made this tonight and it was the frist meal i've made in our new home. It was absolutly fantastic! I only did two things differently. I put the lemon juice into the pot while the pasta was cooking so that the lemon was there but not over powering since its also on the chicken. Secondly I didn't use the capers because i'm simply not a huge fan of them. The meal was really good and i would really reccomend it! This was not good. The chicken turned out terribly and the sauce was grainy. It didn't taste like it should have. I was basically eating parmesan cheese on pasta. I will not be making this again and I advise others to find a better recipe. The capers and zucchini were the only good parts of this dish. Well, as soon as I poured in the half and half, it curdled and became chunky. I thought maybe the cheese would make it creamy, but it didn't. I ended up with water pasta with chunks of cheese and half and half. Maybe I needed to let the half and half warm up a bit before I added it? I was a little skeptical about adding a milk product directly to so much citric acid. Oh well. This didn't taste bad, just wasn't creamy chicken piccata like I was hoping for. Absolutely LOVED this! Cooked it myself and made a post about it to recommend your recipe to all: http://potspansandpaintbrushes.blogspot.com/2012/04/pyrc-8-creamy-grilled-chicken-piccata.html. Sorry but we did not love this recipe. We grilled the chicken and it was very good but the sauce for the pasta was too tangy. Will try some other piccata recipes. Just made this for dinner, delicious! I only had 1 lemon left for the sauce, and it ended up being the perfect amount for me. I have some kale that needs using, and usually I make a penne and feta mixture with it. The whole time I was reading your recipe I kept thinking how good this sauce would taste with the kale. Either way, it is a must try! YUM! We made this tonight and it is delicious. I loved all of it and had no problems with the recipe. We will definitely make it again. WOW! This was absolutely disgusting!!! I just made this and had to throw it all away... noodles and chicken!! I read everyones comments and hoped the bad ones weren't true. Oh but they are. Nasty Nasty Nasty!! Lemon is too strong and I still cut the measurements in HALF! Soo disappointed. Don't make this save yourself time and money! I just made this for lunch and I thought my husband had died and gone to heaven!!! He LOVED it!!! I didn't use 3 tbsp of lemon juice because I didn't have that much, but I used all that I had. Maybe 1-2tbsp. We grilled the chicken and it was PERFECT!!!!!!! Since I didn't have any lemon juice for the sauce, I left that out, as well as the capers. I liked the sauce like that. We will definitely be making this again! I served it alongside some broccoli and applesauce. Mom loved it, baby boy wouldn't try it, and husband endured it. Too much lemon for him. Next time, we will reduce the amount of lemon by half. He was puckering throughout the meal. It was really good even though my sauce didn't turn out right. I'm going to try it again. This is probably my all-time favorite pasta recipe! Something I wish I could have every day, in fact (but I don't!). Love love love it. This is a very lemony dish, I will try this again with less lemon. I left out the capers and used thin slices do green onion as a garnish. Any suggestions on how to amend this recipe to not use the grill, could I bake the chicken in the oven instead? Jennifer - you can pan sear the chicken about 3-4 minutes per side (depending on how big the chicken is) or you can bake it in the oven for about 20 minutes. I prefer to pan sear the chicken - I like the color it gets from cooking in the pan. This has become one of our very favorite dishes! I absolutely adore it! My daughter doesn't like the capers, so I just serve them on the side now (I think it adds so much to the dish). Just made this - pan seared for about a minute and a half and then threw the chicken with its "marinade" and 1/2 cup water in the oven, covered, for 16 minutes at 325. Used egg noodles and had to add more Parmesan, half and half, and butter to get the flavor I was gearing for. My "chicken and rice" and "beef and potato" family absolutely loved it! A quick suggestion to all the "bad experiences" - TASTE IT WHILE COOKING!! The best part of making things at home is that you can tailor the recipes to your liking! I have made this now twice and my family raves about it. My husband comes from a family of cooks and when he ate this meal he said it was an emotional meal for him...lol. its delicious! i enjoyed the dish, but could not get the sause did not come out smooth, what did i do wrong???? the kids loved the taste but not the texture !!!! For the record I grill my chicken breasts on my George Foreman grill. I only have a charcoal grill and using it for 2 chicken breasts is a waste. But I figured out why my sauce didn't turn out. I used shredded parmesan instead of grated. Other than that it's delicious. I tried this last week, and it was delicious! Tonight, I added some red pepper flakes to the sauce, and it added a nice kick! Thanks for posting! I made this tonight but just threw all the ingredients together and cooked my chicken in a skillet on low. Was nice and juicy and tender. The sauce I used very small amout of water for the sauce and just Squeezed some lemon juice into the sauce instead of what it called for. My daughter who hates everything loved this meal. I tried this out tonight and it was pretty good with the following modifications: I used 1/2tbsp of fresh lemon juice in the marinade; I pan seared chicken instead of grilling; I used 1/3 cup of grated parm cheese. I only squeezed a tad bit of lemon juice into sauce (6tbsp seems excessive for our taste). I also added a little flour to sauce to make thicker consistency. I used 1/2 tsp of garlic powder in marinade and sauce. Would prefer more sauce though. Made this last weekend!! Perfection! Everything about this recipe was perfect!! The chicken is wonderful! That marinade smells wonderful & tasted even better! Don't skip this one, you won't regret it! HI, I've made this twice now and I must be doing something wrong...each time I've made it the sauce curdles when the cream and lemon are combined. Help! What am I doing wrong? That looks so incredibly delicious!!!! Loved it! Used fresh basil and garlic, held off on so much lemon juice in the sauce (used half a lemon) and baked the chicken since hubs was out of town. Served it with roasted squash and steamed brocolli and it was the best meal I've had in a while. Next time will grill it and it'll be even more delicious. And I think I'll use more capers :) great recipe. This was so easy to make. I found the lemon flavour a little weird but I got used to it and I found adding extra parmesan on top mellowed it a bit. Thanks for the recipe and adding another recipe to my repertoire. Wow my fiance and I loved this!The chicken marinated in my fridge for about 14 hours from frozen, we grilled according to package directions and it was perfection. Our chicken was a tad dry, yet very tender almost like rotisserie chicken. Those whose chicken isn't turning our just may be miscooking it. The pasta sauce turned out great too. The only thing we would change is less lemon, I used 5 TBSP and we agreed it was a little much.